One of the largest recording studios in Europe offering the unparallel quality combination of the perfect space, state-of-the-art recording equipment and technologies and SOURCE CONNECT. The Czech National Symphony Orchestra and a highly experienced team of sound engineers and office staff round out the offerings of this prominent recording studio in Prague, Czech Republic. Legendary conductor maestro Libor Pesek is resident Chief Conductor and is the driving force behind the inspiring and sensational sounds produced by the orchestra. It is this powerful combination that has brought such personalities as Luis Bacalov, Bruno Coulais, Michael Kamen with Kevin Costner, Chris Norman, Ennio Morricone, Marcello Rota, Paul Potts, The Digital Records, Victor Entertainment, Europe band, Ne-Yo and countless other artists and production teams to Prague. 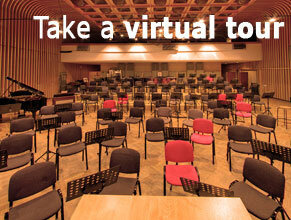 The recording studios are located just 15 minutes from the centre of Prague. We offer our clients full service that includes local transportation, accommodations in first class hotels, in-studio catering, comfortably appointed “green-room” facilities and more. Recording with the CNSO means no limitations on your needs. We offer two recording studios: Studio No.1 – Gallery and Studio No. 2 – Blue Velvet. A full range of genres is recorded in Gallery including film, TV, and video game music. But, thanks to their versatility, the CNSO recording studios are often requested for recording other styles as well. The Czech National Symphony Orchestra records their classical works either in Gallery, or live in famous Prague concert halls. If you are searching for a professional sound studio, a top orchestra and if you look forward to relaxing after the recording in a romantic setting like Prague, you have come to the right address!